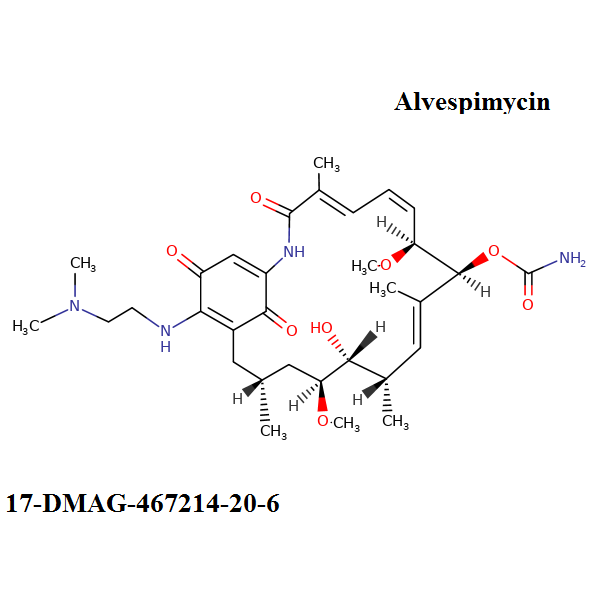 17-DMAG, also known as Alvespimycin, is a semisynthetic derivate of Geldanamycin, of less hepatotoxicity, improved water solubility. 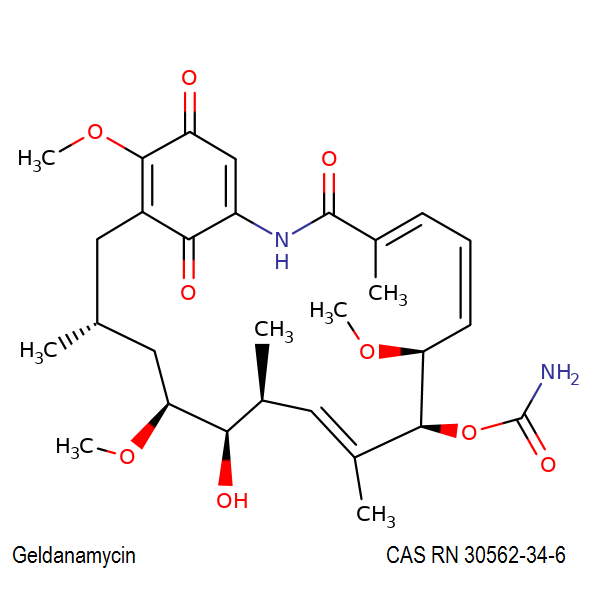 17-DMAG is an ansamycin antibiotic which binds to Hsp90 (Heat Shock Protein 90) and alters it function. Organ-specific efficacy of HSP90 inhibitor in multiple-organ metastasis model of chemorefractory small cell lung cancer. Takeuchi S, Fukuda K, Arai S, Nanjo S, Kita K, Yamada T, Hara E, Nishihara H, Uehara H, Yano S.
Int J Cancer. 2015 Sep 17. doi: 10.1002/ijc.29858. P-glycoprotein confers acquired resistance to 17-DMAG in lung cancers with an ALK rearrangement. Kim HJ, Lee KY, Kim YW, Choi YJ, Lee JE, Choi CM, Baek IJ, Rho JK, Lee JC. BMC Cancer. 2015 Jul 29;15(1):553. doi: 10.1186/s12885-015-1543-z. Rapid externalization of 27-kDa heat shock protein (HSP27) and atypical cell death in neutrophils treated with the sphingolipid analog drug FTY720. Skrzeczyńska-Moncznik J, Bzowska M, Nogieć A, Sroka A, Zarębski M, Vallières L, Guzik K.
PU-H71: An improvement on nature's solutions to oncogenic Hsp90 addiction. Pharmacol Res. 2015 Sep;99:202-16. doi: 10.1016/j.phrs.2015.06.007. Epub 2015 Jun 25. Review. Targeting HSP90 Ameliorates Nephropathy and Atherosclerosis Through Suppression of NF-κB and STAT Signaling Pathways in Diabetic Mice. Lazaro I, Oguiza A, Recio C, Mallavia B, Madrigal-Matute J, Blanco J, Egido J, Martin-Ventura JL, Gomez-Guerrero C.
Diabetes. 2015 Oct;64(10):3600-13. doi: 10.2337/db14-1926. Epub 2015 Jun 26. Heat shock protein 90 inhibitor regulates necroptotic cell death via down-regulation of receptor interacting proteins. Park SY, Shim JH, Chae JI, Cho YS. Co-inhibition effect of 17-DMAG and oxaliplatin on proliferation and invasion of colorectal cancer cells. Zhou J, Wang W, Deng J, Zhou Y, Wu L, Guo Z, Shi J, Shi J, Zhou S, Xu Z.
Zhonghua Wei Chang Wai Ke Za Zhi. 2015 Apr;18(4):370-5. Chinese. The HSP90 inhibitor alvespimycin ( 17-DMAG ) enhances the potency of telomerase inhibition by imetelstat in human osteosarcoma. Hu Y, Bobb D, He J, Hill DA, Dome JS. Cancer Biol Ther. 2015;16(6):949-57. doi: 10.1080/15384047.2015.1040964. Epub 2015 Apr 28. Molecular chaperone Hsp90 is a therapeutic target for noroviruses. Vashist S, Urena L, Gonzalez-Hernandez MB, Choi J, de Rougemont A, Rocha-Pereira J, Neyts J, Hwang S, Wobus CE, Goodfellow I.
J Virol. 2015 Jun;89(12):6352-63. doi: 10.1128/JVI.00315-15. Epub 2015 Apr 8.